On March 1, OMRF welcomed students and faculty from Stillwater High School to thank them for raising funds for cancer research at the foundation. During its annual “Pink Out” week in the fall, Stillwater students raised $11,890.44 for cancer research at OMRF. 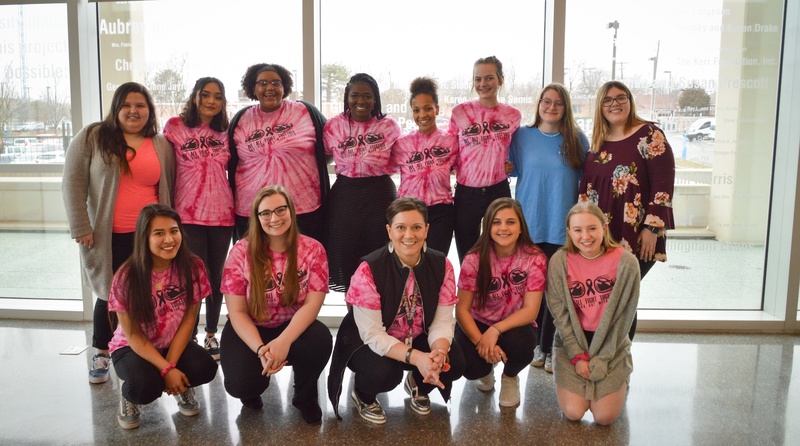 Activities included a silent auction, dine-in funding at local restaurants, passing buckets at football games, and a powder-puff football event. Thirteen students and faculty were treated to lunch and a tour of the foundation’s facilities and got an up-close look at the research underway in OMRF’s laboratories. Since naming OMRF as its charitable beneficiary in 2011, Stillwater High has raised more than $50,000 for cancer research at the Oklahoma City-based nonprofit. The funds have helped OMRF study errors in cell division, a process that leads to cancer. Foundation researchers have also created an experimental drug to treat a deadly form of brain cancer; that drug is now being tested in Oklahoma cancer patients.